Slow down and allow yourself to have a relaxing vacation in Guilin. 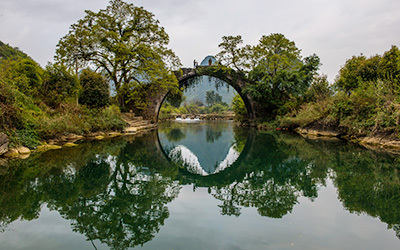 This 6 days tour covers the highlights in Guilin, Yangshuo and the Longsheng Longji Rice Terraces, and allows you to enjoy the peaceful scenery, countryside, and traditional ethnic cultures at a relaxing pace. Walk on a less-visited rice terraces trail. 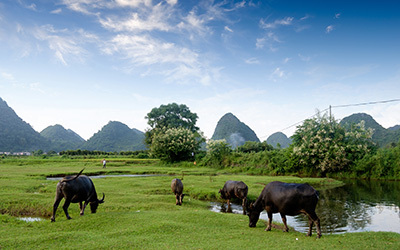 Cycle through Yangshuo’s countryside and see locals working in the fields. Relax on a bamboo raft on the calm Yulong River, enjoying the peaceful countryside. No rush: relax and travel at your own pace. No fixed itinerary: one-to-one local experts for your requirements. With so much to offer, it can be difficult for a first-timer to plan a trip that is both relaxing and filled with experiences. The following itinerary can be one possibility and your interests will decide how this trip is to be designed and executed. 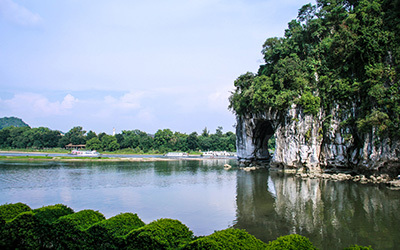 Upon your arrival in Guilin, you will be transferred straight to Longsheng. Check in to your hotel and enjoy the mountain breeze as you clear your head. 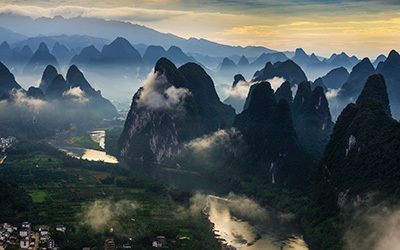 A one-way transfer from Guilin to Longsheng usually takes about 3 to 4 hours on the mountain road. We will arrange for you to travel on the highway to shorten the journey to 2½ hours. No time is wasted upon your arrival as we will transfer you straight away. However, it’s necessary to spend a night in Guilin if you arrive after 7pm. Construction of the rice terraces began about 600 years ago and now the ethnic minorities who live in Longsheng are still very dependent on this massive farming project. You can walk up or take a buggy ride up to the top, providing an awesome view over the rolling mountains laced with lush rice paddies. 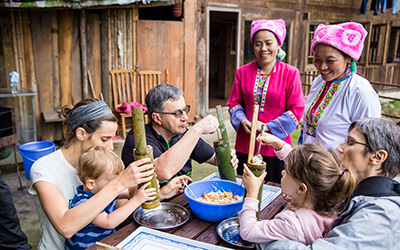 Later, walk down to a Yao family’s home where the host will introduce you to their unique bamboo rice cooker and oil tea culture. Enjoy a chat with them before lunch. 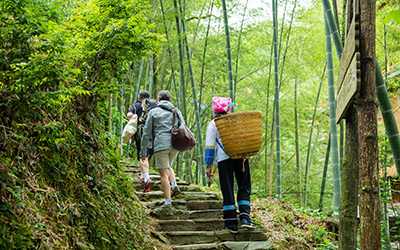 Gear up for an easy hike along the mountainous trail from Ping’an Village to Guzhuang Village. The former is home to the Yao ethnic minority while you will see different customs of the Zhuang people in the latter. The hike covers the most picturesque parts of the rice terraces and you will meet some lovely locals along the way. Your private driver will be waiting for you in Guzhuang Village with your luggage, ready to transfer you back to Guilin where you will enjoy a relaxing evening. The hike from Ping’an Village to Guzhuang Village is about 2 kilometers, mostly on downhill steps and country roads, taking approximately 1½ hours at a slow pace. We can hire some local porters to carry your bags and the roads are in good condition for hiking. An important trading port back in its heyday, Daxu Ancient Town is now almost forgotten by the outside world. Yet something interesting can still be found here: as you walk around this small town, you will learn about the trading history and, most intriguingly, an old gentleman will show you his fun collection of daily-use items that have been used by others over the last two centuries. 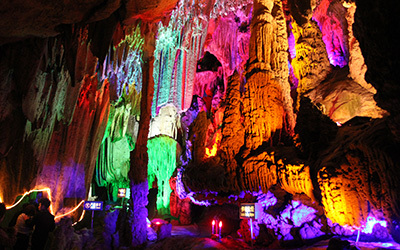 After lunch, visit the landmarks of Guilin: Elephant Trunk Hill and Reed Flute Cave. The rest of the day is free for you to spend at your leisure. 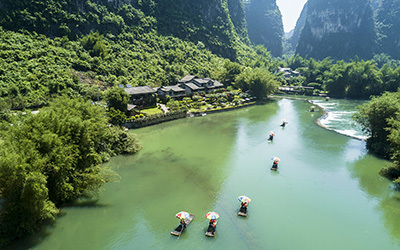 As the Li River weaves its way gracefully through Guilin and down to Yangshuo, the natural landscape is brought closer to you while you enjoy the 4-star Li River cruise (this is the highest level of cruise, offering better facilities and a buffet lunch). Chinese people are great dreamers and most mountains are named after their quirky appearances. You might need to use your imagination to see the same shapes; of course, you might just as well kick back and empty your mind while the wind tousles your hair gently. Arrive at your resort in Yangshuo in time for afternoon tea. Sit back in a relaxed setting with a nice cup of coffee — that’s what a vacation should be like. Enjoy a relaxing night in Yangshuo. The Li River cruise normally takes 3 to 4 hours during summer. You will be in Yangshuo in the early afternoon and we have some options for you to choose from if you’d like something fun to do, such as Chinese calligraphy or a cooking class, among others. Some claim that whatever Guilin offers, Yangshuo also has it and it’s much better. Test this saying with your own experiences. Before the sun gets too high for a cool ride, explore the countryside by bike. Narrow single-lane trails lead you to secluded villages and boundless fields, and you will pass by locals waving hello to you. After lunch, get on a traditional bamboo raft with a private punter to sail along the Yulong River. No noisy motor rafts are allowed on the Yulong River and you can enjoy a tranquil moment while the reflections of the mountains and bamboo groves pass by. There are many rafting routes and your tour guide will choose one according to the season and timing of your trip. Day 6 — Yangshuo–Guilin | Until Next Time, Guilin! Say goodbye to Yangshuo and transfer to Guilin. Connect with your departure flight. Thanks for making this wonderful trip with us and we hope to see you again soon!